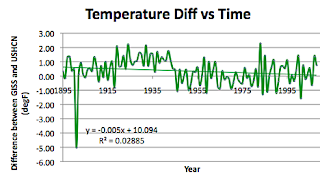 Back in June I reached the State of Indiana in my survey of how time had affected the state temperatures around the country, and whether the changing numbers of stations that are being used to generate the average values had any overall significance. However, when I reached Indiana, the USHCN site had changed the numbers that had been posted. Instead of just posting the homogenized data for each site after it had been examined relative to other station sites, both RAW and TOBS data was now included. This caused me to go back and revisit all the states I had already reviewed, and I must add those to the State roll at the bottom right of the page. After this weekend it will get a little more complex, since in the states I have not done I will review both the homogenized and TOBS data to see how they differ. 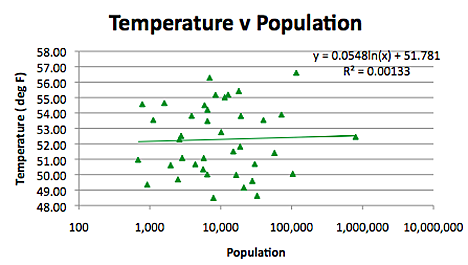 Looking at the TOBS value for Indiana, one of the problems in the state in comparing overall averages to the GISS data is that, as I noted last time, there is a significant impact when the South Bend data is included in the GISS data in 1944, given that it is in the North of the state, and as I have found consistently around the states, there is a strong temperature correlation to latitude. 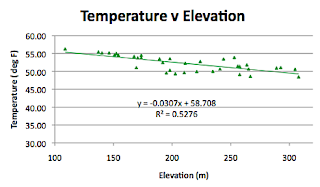 The curve is not that much different to the one that was generated from the homogenized data. 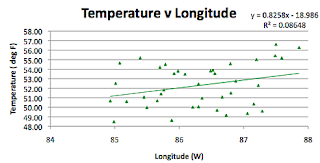 When, however, the overall average temperature for the state is examined, then changing from homogenized to TOBS data does make a difference. 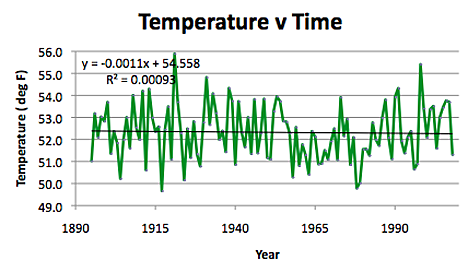 With the homogenized data there was an upward trend of 0.005 deg per year. When the TOBS data is examined, there is a change. 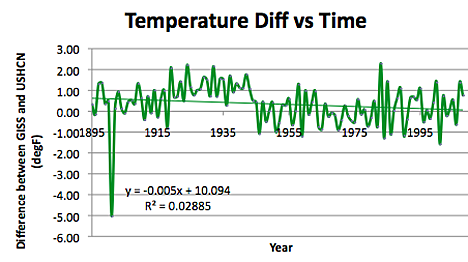 Although the change is small, it does shift from a positive trend over the years to a negative. It will be interesting to come back in a while and see how common that is in the Central states that are away from the sea. 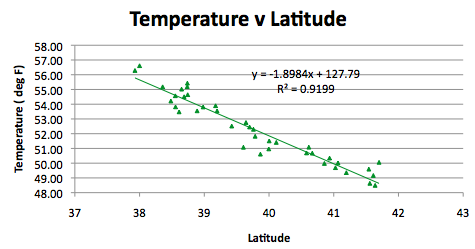 Indiana being relatively flat and homogenous as far as geography, one again sees a very good correlation of temperature with latitude. This is the second state in a row with a very high correlation. Given that this is significantly better than that achieved with the homogenized data, one wonders if the homogenization tends to blur some of the effects, because of the averaging and the way that it is done? There is also, despite Indiana being relatively flat, a good correlation with elevation. 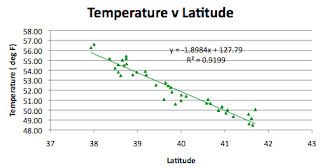 Again, with the TOBS data, the correlation is stronger than with the homogenized data, suggesting that the homogenization is removing some of the influence of the geography. 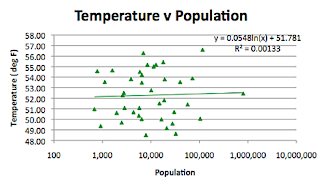 However, as with Illinois, while there is significance in the geography, as the populations get larger in the communities the correlations with population become more tenuous.